Univ Of Minnesota Press, 9780816683024, 200pp. Margi Preus is a New York Times–best-selling author of books for young readers, including Shadow on the Mountain, West of the Moon, and Heart of a Samurai, winner of a Newbery Honor and the Asian/Pacific American Award for Children’s Literature. She has been a lover of mysteries since she was allowed to stay up past her bedtime to watch Perry Mason with her dad. Enchantment Lake is her first mystery. 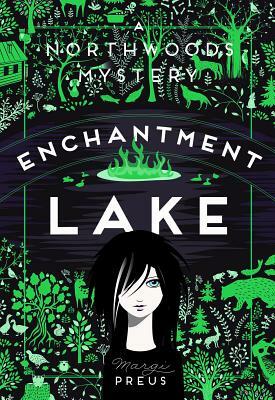 "After playing a detective on TV, seventeen-year-old Francie travels to idyllic northern Minnesota to help her aunts. People are dying in strange accidents on Enchantment Lake, and the deaths seem to revolve around a treasure—could it be hidden at the bottom of the lake? In this charming first mystery, Francie finds the answers to most of her questions and even a bit of enchantment for herself." "Minnesota’s master storyteller Margi Preus gives us another gem of a novel—funny and moving, gorgeously written, and suspenseful. As much as this book is an absorbing mystery, it’s also a deeply felt love letter to our uniquely enchanted northwoods. This is a book to lose yourself in."